The Urbanaut® is a new monorail technology, superior to the 50-year old straddle-beam type technology. With its unique alternative traction system, it has the ability to climb hills 3 times as steep as the old steel wheel-steel rail concept. It is environmentally friendly and can be adjusted to the landscape, avoiding expensive tunnels and deep, damaging expensive cuts for rights-of-way through existing residential communities. Urbanaut® has great flexibility. The spherical area requirement is the smallest of any comparable transit. At grade and in a tunnel, it requires only a concrete slab. 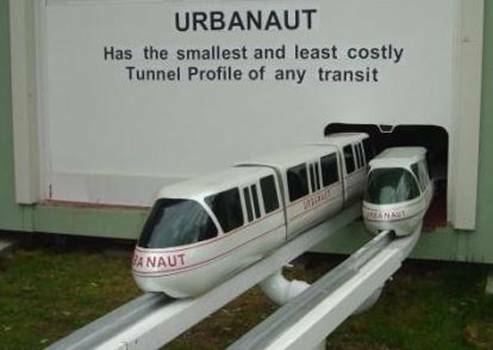 Urbanaut® is not dependent on a massive beamway like other monorails. Urbanaut® has one of the smallest and least expensive underground cross-section area and requirements. A 3-car train is entering and a single car is leaving a tunnel. Ventilation and fire protection devices are provided along the roof of the tunnel. Power for propulsion is along the center guide rail contrasted to light or heavy rail's overhead power supplies. 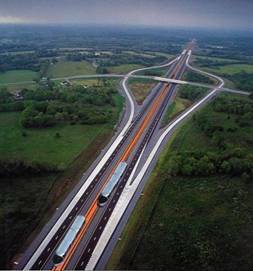 v Urbanaut® trains have a turning radius as small as 38m (125ft), allowing for sharp curves at 90° street intersections. 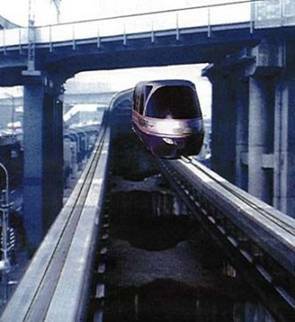 v Straddle type monorail systems have major problems because of large turning radius requirements and inability to climb steep hills. The Urbanaut® allows for sharp curves at 90° street intersections. A compact vehicle bogie interlocks with the center of the guide rail, which makes derailment virtually impossible. This unique arrangement allows for automatic spring loading of the guide wheels, which, during steep climbs, preloads the traction tire wheels and prevents slippage. 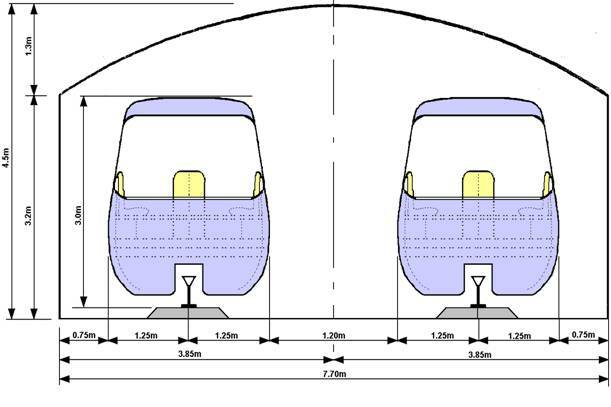 In comparison, both the larger turning radius required and the inability to climb steep hills are major problems for the straddle-beam type monorails and light rail. 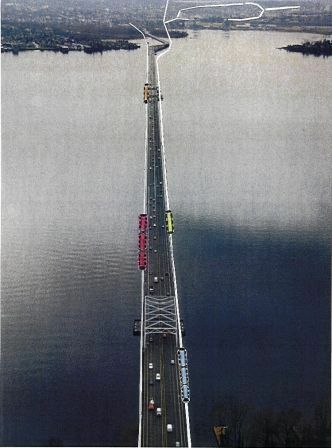 This least costly and more efficient alternative for the bridge crossing Lake Washington between Seattle and Bellevue in Washington State, USA was endorsed by BWR, a large USA transportation consultant. The Urbanaut's two guideways on additional pontoons along the side of the bridge could double the passenger capacity of the current auto traffic. 1. In stormy weather the water for the current bridge washes up across the bridge, forcing traffic to slow down and sometimes shut down. The cantilever overhang prevents such from happening. 2. The cantilever costs considerably less in comparison with building additional pontoons. 3. It provides space for bicycles and pedestrians in addition to serving as an emergency evacuation area. 4. It helps stabilize the bridge dynamically, laterally and vertically. 5. It requires less buoyancy area than extra pontoons. The proposed light (heavy) rail for the Lake Washington floating bridge is antiquated, costs taxpayers 3 times more, and is not a futuristic transportation technology. Major metropolitan cities like Paris, Montreal, Mexico City, Taipei and others are changing their steel wheel/steel rail systems to rubber tires, similar to what is applied by the Urbanaut. The reasons are operating costs, noise, limited traction, limited max. grade of 2%, acceleration and braking capabilities. 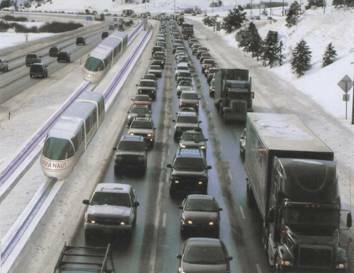 An inexpensive high speed Urbanaut® constructed on a 1.1 meter wide surface guideway in the median of a freeway can favorably compete with autos, thus reducing the congestion and gridlock on the freeway, and provide a relaxed, stress less ride and a much shorter traveling time at reasonable cost. A SemiMaglev Urbanaut™ with a potential speed of 225 km/hr (140 mph) could, for example, travel from Vancouver BC, Canada to Eugene, Oregon, USA, a distance of 690 km in approximately 4 hours with 1 minute stops in Bellingham, Everett, Seattle, Bellevue, SeaTac Airport, Tacoma, Portland, Salem and Eugene. This is half the time an auto would take driving nonstop with no freeway congestion. There are numerous other similar application sites along freeways in the USA and abroad. Such an inexpensive high speed Urbanaut® as a back-bone system can have passenger transfers to slower speed Urbanaut® Circulators or distribution networks serving high density communities and cities. Applying the same technology throughout has numerous practical and economical advantages. It becomes more efficient, has greater capacity and is a less costly alternative than complicated tunnel diversions and expensive, massive, outdated steel wheel-steel rail concepts. The maximum economical speed of 225 km/hr (140 mph) is probably the upper speed for an Urbanaut or high speed rail along our freeways because of the limited right-of-way curvatures. 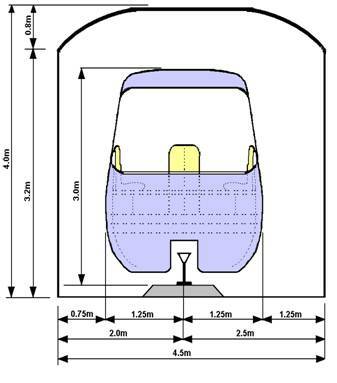 Proposed ultra high speed maglev systems of 310 mph (500 km/hr) require very large radial curves, which would require additional right-of-way along our freeways, and longer distances between stations, substantially increasing the costs. An example of factual application is the Urbanaut® Circulator applied to a city in the USA. An Urbanaut® elevated, surface or subsurface, single or dual line right-of-way loop concept can be applied to distribution of people within communities, industry, shopping center, health facilities, ports, parks, university and school campuses, recreational areas and numerous other sites. 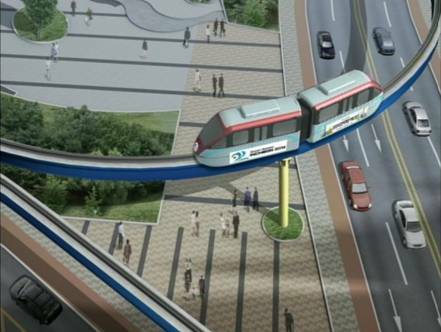 Such a guideway concept is expandable and can be connected to other future loops or guideways if needed. During high capacity demands, vehicles (trains) will operate continuously around the loop, programmed for maximum service. Several "circulator" loops can be integrated, with transfer from one to another possible. High Capacity Dual Elevated Urbanaut® located between 6 surface lane and a 4 Lane Elevated Deck has a combined passenger capacity of 20 lanes.